Islamabad Metblogs » Caption It! Image Courtesy: Hanif Khattak – He has a lot more to offer from the election day happenings. Its gesture which is seen in revolutions, which is what we are witnessing right now, my caption would "carrying mother for MOTHERLAND". people are desperate for a positive political change! The captions suggested by you are absolutely wrong. I salute these ladies. This is what is needed to rebuild our nation; not sarcasm. @kamran: there’s no sarcasm involved here … in case you have missed what i wrote after quoting shahab. @Syra: indeed – we are yearning for revolutionary change for betterment of our motherland. I find the suggested captions in poor taste. The people in this picture are nothing less than commendable for going to these obvious pains to cast their vote. 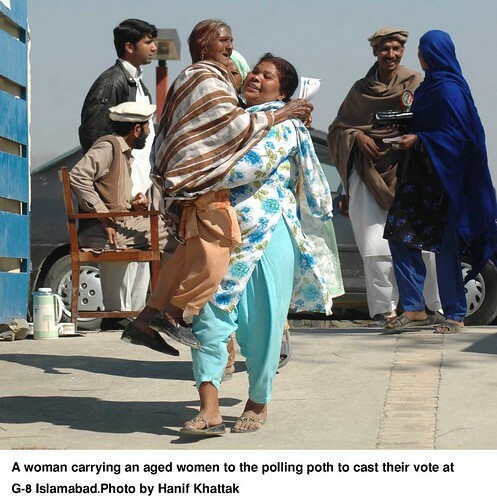 "Democracy may be heavy, but it is a load worth bearing"
Bravo to these two ladies, whoever and wherever they are!